There is a seismic behavioral shift occurring in retail. The signs are everywhere. The first sign is the persistent rise in online shopping. 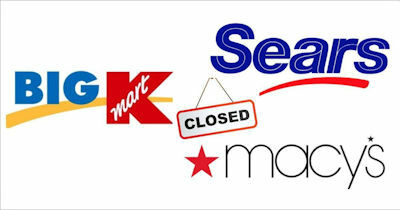 Combine this with major retailers like Macy’s, Sears/Kmart and JC Penny (to name a few) shuttering stores. There is a also an increase in DIFM shopping (Do It For Me) in the grocery category where companies like Instacart and Shipt are more than willing to do the shopping for you. Is this the end of the physical retail as we know it? Or is there something else going on – a rightsizing of retail based on Shopper DNA? Behavioral shifts are gradual. This gradual shift is due to most people resisting change. They get set in their ways and therefore they are resistant to adopt new behaviors. However, when someone changes their behavior, there is a a core motivation at the root of the shift. In shopping our DNA is many times the catalyst for change. An example of this is the Time DNA. The Time DNA strand reflects how much time someone wants to spend in the retail environment. In over a dozen shopper behavioral studies (measuring the Shopper DNA within different categories), I found shoppers are normally split roughly 50/50 – 50% like to shop and 50% detest shopping. Think about this: if I detest shopping then I will find ways to minimize my shopping excursion. In other words, this shopper is on a mission to complete their shopping and get on with their life. The most probable solutions, to reduce store time, are buy online or have someone shop for me. As this Mission shopper shifts their shopping from offline to online stores, their are fewer sales completed in brick and mortar stores. This behavioral shift has been gradual over the past decade or so. As a shopper becomes accustom to shopping online, they begin to use it more and more. If they detest shopping, they are far more motivated to use online channels to limit the time spent in store. However, not everyone hates shopping. There is the alter-ego to the Mission shopper to consider – the Journey shopper. Unlike the Mission Shopper, the Journey shopper likes to shop. They look forward to the experience. For some Journey shoppers, shopping can be a form of entertainment. Worth noting is a shopper can be a Mission shopper in one product category and a Journey shopper in a different category. For example, a shopper can be a Journey shopper when shopping for clothes, and be a Mission shopper for groceries. The Journey shopper is driven by different factors, but two are dominate: Brand Energy and Deal Energy. Brand energy is fueled by the shopper’s preferred brand(s). Sometimes the store is the brand like the Apple, Nike, Trader Joes, or Gap. These stores primarily (or exclusively) carry the brands based on the store’s name. These stores live or die by their brand energy. If their brand is desired by many people, the store will prosper. If not, well, the brand is one step away from store closure trying to become socially relevant again. This is the case with Abercrombie & Fitch. A well-known brand fallen on some hard times. Currently they are rumors circulating about a pending sale and store closures. The brand is trying to change it’s image (per Forbes) by shifting to a slightly older demographic, new store formats with tech integration, and A&F is pumping up it’s social media presence to create brand energy. Another factor with Brand Energy is the availability of the brand. If the availability for the brand is only at the store, the exclusivity may be enough to maintain brand energy. However, if many different retail stores carry the product, then the only distinguishing factor would be the retail experience. Apple is an example of providing a unique experience over and above their products. Their expertise and advice about how to use their products is a valuable differentiation that drives traffic. Deal energy is the other factor driving the Journey shopper. The hunt for the deal or “find” drives many shoppers. Different stores use different tactics to create deal energy. Bed Bath & Beyond uses it’s classic 20% coupon for deal energy. Kohl’s uses a combination of a percent off coupon up to 30% plus Kohl’s cash which is $10 for every $50 the shopper spends during promotional periods. Target uses their Cartwheel app, their store credit card, plus manufacturer coupons to create deal energy. These are just few examples. Most retail stores offer some type of deal, and this is the problem. The deal seeker expects the deal and is more than willing to switch stores based on the most relevant deal for them. In effect the store may become commoditized, because they offer no differentiating experience or product to cultivate loyalty. Keep in mind the Journey shopper is looking for the find. They are willing to spend time to save money – spend time to find the deal. This does not mean they exclusively shop offline, rather, they use a combination of offline and online. In a way some of these shoppers are always on – always looking for deal. Since they they spend a considerable time shopping, they know a deal when they see it. Creating deal energy is more than just couponing or loyalty points. TJ Maxx is a store catering to the deal seeker. They carry designer brands at significant discounts (they even put the deal on the tag), and they turn over inventory quickly. So, if a shopper finds a deal at TJ Maxx, they need to buy now or the item may not be there when they return. This approach fuels impulse purchases due to the shopper’s fear of losing out on a deal. Many retail stores attempt to create deal energy to attract shoppers, and yet they are still closing stores. A simple reason for store closures is other nearby stores have a stronger deal energy. And by the way, just changing your sales strategy will not solve the problem. At least not overnight. The reason (again) is the resistance of a shopper to change their behaviors – change their stores. If a person is comfortable with Target’s deal tactics, products, and store layout, it would be challenging for a competitive brand to break the shopper’s attachment to Target. A second reason for the store closures is the amount of Journey shoppers (and Mission shoppers not using online) within their retail area can’t support the number of stores. This over-saturation within the retail space has been identified by many industry experts as a reason for store closures. The closures will continue until there is an equilibrium point between Journey and Mission shoppers and offline and online behaviors. So, given all this where does this leave a store brand? Bottom line: don’t get caught in no man’s land. No man’s land is the territory lies between stores thriving on brand energy and stores thriving on deal energy. From a shopper’s perspective, stores in no man’s land lack an emotive attraction to entice them to shop. The only play, if there is no deal or brand energy, is convenience. This only works if the store is the only game in the neighborhood. Convenience is fine, but not a sustainable differentiation. Local shoppers will use the store in a pinch to quickly buy some items. However, if the shopper has time, they are more likely to bypass the neighborhood store and shop at a store with more energy.